WASHINGTON—Coming off one of the most difficult weeks of his presidency, Barack Obama has beefed up his political staff and is expected to deliver an uncompromising State of the Union address. Aides said Sunday that the White House wasn’t making any abrupt policy shifts, even as the message was retooled to focus more sharply on job creation. If anything, an unfinished agenda from 2009 will grow larger as, in addition to tackling health care and unemployment, the president presses for a bipartisan commission to tackle the budget deficit against resistance from Republicans. White House officials said Obama campaign manager David Plouffe would be brought on as a political consultant as the White House gears up for the midterm elections. The president’s party is facing a stiff headwind from an electorate angry about high unemployment and what they see as ineffectual government, White House officials said. Republican Scott Brown’s capture of the Massachusetts Senate seat Tuesday was a first shot in what Democrats worried would be hard-fought contests in November. Associated Press Mr. Obama takes questions during a town hall-style meeting at Lorain County Community College in Elyria, Ohio last week. “People are working harder,” White House senior adviser David Axelrod said Sunday on ABC’s “This Week,” referring to the economy. “If they have a job, they’re working harder for less. They’re falling behind. That’s been true for a decade. They look at a wave of irresponsibility from Wall Street to Washington that led to that. And those were the frustrations that got the president elected in the first place, and they were reflected again on Tuesday” in the Massachusetts election. The message Mr. Plouffe is bringing was a collaborative effort by him, White House officials and the leadership of the Democratic National Committee. That message is one of no retreat in the face of polling that shows opposition to the president’s push to overhaul health care and discontent with his economic efforts. Writing in Sunday’s Washington Post, Mr. Plouffe said Democrats needed to quickly pass a broad health overhaul, get serious about job creation even as they tout the impact of last year’s stimulus package, turn up the heat on Republicans over the deficits incurred in the Bush years, and stop grousing about the political climate. 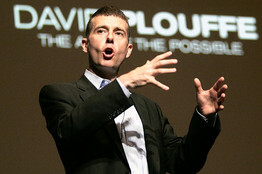 Associated Press David Plouffe, shown in France in June, managed Mr. Obama’s presidential campaign. “Instead of fearing what may happen, let’s prove that we have more than just the brains to govern—that we have the guts to govern. Let’s fight like hell,” Mr. Plouffe wrote, striking the same chord Mr. Obama did at a town-hall meeting in Ohio Friday and likely will Wednesday in his first State of the Union address. Republicans said Mr. Brown’s victory was a repudiation of the Obama agenda, not just of Democratic dithering. 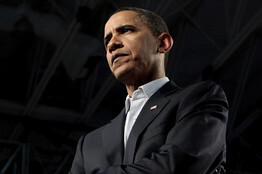 Sen. John McCain (R., Ariz.) urged the president to move to the center and engage Republicans. Mr. Obama did that on one issue. On Saturday, he endorsed legislation in the Senate to create a bipartisan commission to tackle the budget deficit, with an up-or-down vote in Congress on its recommendations at the end of the year. A vote on creating that commission is scheduled in the Senate for Tuesday, and it is not expected to pass. White House officials hope the president’s endorsement of the bill will soften Republican opposition to his plan to create a similar commission by executive order. That commission will need GOP cooperation to fill eight of the 18 seats on the panel with Republicans. Concurrently, a group of retired senators on Monday plans to announce that former Republican Senate Budget Committee Chairman Pete Domenici and Alice Rivlin, a top Democratic economist, will spearhead a yearlong effort to devise a plan to slash the federal debt. Unlike many other studies, the Domenici-Rivlin panel will put forward a detailed blueprint for the country’s future solvency. That could help the presidential panel win political support as well. The Domenici-Rivlin panel is backed by former Republican Sens. Robert Dole and Howard Baker, and Democrat Tom Daschle. —Neil King Jr. contributed to this article.